I’m just going to come out and say it: If you’re looking to get a mortgage, rates right now are pretty darn low and have been for a while. For those looking to purchase or refinance, you couldn’t be doing it in a better rate environment. The Federal Reserve has held interest rates at close to zero for a long time now. This is good for those that are looking to make big purchases, because it means the cost of getting a loan is comparatively lower. 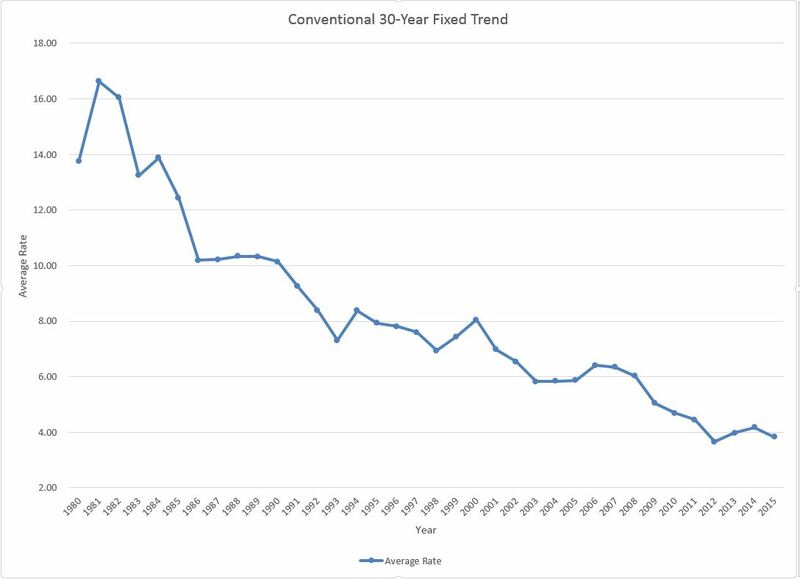 The policy of low short-term interest rates has helped keep mortgage rates low. How low? Check out the chart and see for yourself. As you can see, it’s a really good time to purchase or refinance a home. However, there’s another side to the pendulum. If the cost of borrowing is lower, it means interest rates on investments aren’t as high. Investors don’t get as much back for what they put in. The point of this mini economics lesson is that soon, the Federal Reserve is expected to swing the pendulum back in favor of investment. When it does, interest rates (likely including those for mortgages) will go up. The Fed doesn’t tend to make very many proclamations on the future in advance of their decisions, so why do we think this is coming soon? There are a couple of reasons. The Federal Open Market Committee makes rate decisions. This committee meets eight times a year. After each meeting, they put out a press release. Investors have always parsed this release for any little clue it might bring as to what the Fed plans to do next. They’re usually stymied because the Fed doesn’t like to talk about what its members are thinking ahead of time. After all, the Fed is very dependent on economic data to determine the right time to make a move. It’s often impossible to predict what’s going to happen because economic reports can be very volatile. Those four bold words are important because they tell us a December rate hike is under serious consideration. The Fed isn’t generally this explicit. When they are, economists sit up and pay attention. The Fed is already on alert for any economic reports that might tell them to raise rates in December. As of Friday, they may have gotten what they needed to see. On the first Friday of every month, the Bureau of Labor Statistics releases the employment situation report (often referred to simply as the jobs report). This is among the most heavily watched economic reports because jobs are a key barometer for the health of the economy. This month’s jobs report came back better than expected. In short, 271,000 jobs were added to the economy in October. For context, this is 31,000 higher than Econoday’s highest estimates. The unemployment rate also fell to 5.0%. There’s another jobs report between now and then, but this could be the thing that finally pushes the Fed to raise interest rates in December. So what does all this mean for those in the market to purchase or refinance? Rates aren’t going get any better than they are right now and are likely to climb in the near future. If I saw a rate I liked, I would jump on it and lock now while I had the chance. You might not see that rate again and you’ll be glad you did. The big thing to take away here is to take advantage of today’s low rate environment. Who knows when you’ll see it again? Ready to get started? Check out our revolutionary way to obtain a home loan completely online with Rocket Mortgage! Still have questions? Leave us a note in the comments. Currently my loan is with Quicken Loans. QL has been my best loan holder since I’ve purchased my home( there have been 5 previous loan holders). If I were to check in to refinancing would that mean I would have different lien holder? If your mortgage is currently with us and you refinance with us, you’ll probably stay with us throughout the life of the loan. We service the vast majority of our loan portfolio. I’m going to have a Home Loan Expert reach out and help determine if refinancing might be right for you. I’m going to assume that by 9/16, you actually mean December 16, the date of the next Federal Reserve meeting announcement. We would also need your cell phone in order to text you, which is obviously not a number you want to give out in a public forum. While every situation is different, I’m going to have a Home Loan Expert reach out to you via email to get some more information from you and look into your options. I have 2 mortgages I like to combine into one. My credit is not great but I was trying to get a lower payment between both to make it easier each month. The one payment is 880.00 month and the other is 560.00 month. I’m going to have one of our Home Loan Experts reach out to you to get some more information. They should be in touch in the next day or so.